While pregnancy can be one of the most rewarding experiences of a woman’s life, it is also a time that places a great deal of stress on the expectant mother’s. As the baby develops over the course of nine months, many changes occur within a woman’s body. Hormonal fluctuations are a major factor, helping the baby to develop and preparing the pregnant mother for delivery as the end approaches. The weight of the baby strains the back and hips as well. Back pain in pregnancy is a struggle for many expectant mothers as the period of development progresses as the baby continues to grow. The back pain that pregnant woman experiences can vary from a minor nuisance to pain that is so excruciating it gives the expectant mother no relief. Pregnancy back support and other treatment methods are essential to ease an expectant mother’s suffering, helping her to maintain her strength and well-being as she awaits the arrival of her baby. When it comes to back pain during pregnancy, most women experience either lumbar pain or Pelvic Girdle Pain.Lumbar pain is the throbbing ache that strikes in the lower back, a pain that is known to both men and women alike as the result of strain that is placed on the lower back during daily activities or from bearing too much weight. Pelvic Girdle Pain, also known as PCP, causes a shooting pain at the front or back side of the pelvis. The pain may be intense and travel down an expectant mother’s legs as well. While PCP usually goes away after the baby has been born, many women will continue to battle with lumbar pain while they are no longer pregnant. In rare cases, there are expectant women who are victims of both types of pain, a situation that can make their lives miserable. Living with intense pain can affect a woman’s ability to be physically active, have a negative impact on her sleep, and lead to depression during this challenging period in her life. The best way to help ease a pregnant woman’s discomfort is to figure out what type of pain she is experiencing. The main goal is to ease the burden on an expectant mother’s body until it is finally time to deliver the baby. With a proper diagnosis and care, the hope is that an expectant mother will not only find relief from her pain, but she will not be the victim of back problems after her baby has been born. No one wants to be faced with a chronic battle with back pain, especially new mothers who have so many demands on their bodies as they care for their babies. Pregnancy back pain can get in the way of an expectant mother’s life before and after delivery, especially when she suffers from severe back pain during pregnancy. Many women will be forced to take time off from work after the birth due to struggles with back pain. Most often, lower back pain in pregnancy extends beyond and causes the biggest problems. When back pain is a constant companion, it can make it difficult for a woman to care for her baby and maintain her daily routine.It can wear a woman down before she has even had her child and make pregnancy an extremely stressful period in her life. It is essential that doctors focus on understanding pregnancy back pain in order to identify the source of the problem and provide pregnancy back support for patients. The sooner a proper diagnosis of the specific type of back pain in pregnancy is found, the better. Proper treatment, regardless of whether it is a lower back pain in pregnancy or PCP,can help an expectant mother to overcome the trials that come with any type of chronic pain that can wear a person down. A pregnant woman needs all of the strength that she can get as she prepares for labor. It’s understandable that women may experience pregnancy back pain, especially lower back pain in pregnancy. The strain on the lower back is intense and constant as the baby continues to develop. A great deal of pressure is placed on the lumbar region. The first time that a woman is pregnant, there is a good chance that she will suffer from lower back pain in pregnancy. While Pelvic Girdle Pain may not be as common when it comes to pregnancy back pain, it can result in severe back pain during pregnancy that makes this period in a woman’s life a major struggle. Back pain issues generally begin about midway through a woman’s pregnancy. The longer a woman carries a baby, the more severe the pain becomes. The excessive strain on a woman’s pelvis, back, uterus, and abdomen are the main culprit for lower back pain in pregnancy, and any kind of back pain, as additional weight, is placed on her body. A developing baby may be tiny in the grand scheme of things, but it still changes the balance in an expectant mother’s body.Changes in posture in an attempt to compensate for the additional weight often lead to struggles with back pain as well.When a woman is battling with pregnancy back pain day after day every day, it can be extremely frustrating. The best way to effectively treat back pregnancy back pain is to pinpoint the type of pain that they are experiencing. The best way for doctors to diagnose back pain for expectant mothers is by evaluating the symptoms and performing a physical examination. A Pregnancy Mobility Index is a list of questions that expectant mothers can complete as they go through their normal routine at home. It helps to describe what type of pain they are experiencing and any limits on activity that have occurred due to their pain. It is important that doctors recognize the difference between pregnancy back pain and pain that is caused by pelvic instability. Over the course of pregnancy, the pelvic actually widens as the body’s natural way of preparing for labor to ease delivery. In most cases, the pelvis will go back to its normal size after delivery. In rare cases, the pelvis may not return to its normal size after a difficult labor, especially if medical instruments are used. Surgery may be the only answer to relieve pelvic pain that doesn’t correct itself. What are the Risk Factors for Back Pain During Pregnancy? In the majority of cases, it is common for women to develop some form of back pain due to the strain of pregnancy, even if they never experienced back pain before. However, there are certain risk factors that may increase the possibility of developing back pain, whether it is lumbar pain or Pelvic Girdle Pain. Women who have a history of chronic back pain prior to pregnancy are more likely to experience back pain while they are pregnant. Their previous back pain may be exacerbated while they are expecting. Expectant mothers who have had some type of back injury or pelvic injury are at a greater risk of having problems with their backs during and after pregnancy. If back pain was an issue for a first pregnancy, it can be expected for later pregnancies as well. 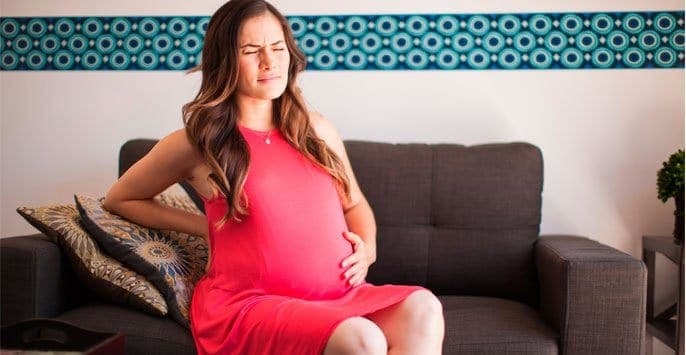 Women who experience lumbar pain during their menstrual cycle are more likely to experience the same type of pain during their pregnancy and in the period following delivery. Their pain may be more troublesome as well. Doctors have found that women who are physically fit and exercise on a regular basis prior to pregnancy have a lower risk of suffering from lower back pain while they are expecting. Unfortunately, exercise does not seem to have any kind of a positive effect on Pelvic Girdle Pain. A woman’s weight, especially if she is overweight, may play a role in causing back pain for pregnant women. What is the Key to Preventing Back Pain During Pregnancy? No woman wants to battle back pain while carrying her baby. Expectant mothers can pay attention to their posture in order to prevent issues with back pain. They can also wear supports for their back to ease the strain. Specific exercises that are intended to strengthen the back and core can be performed regularly from the beginning of pregnancy until the baby has been delivered, although care must be taken to ensure that they are safe. Supportive cushions are helpful when sitting or lying down to provide additional support for the pregnant woman’s back. Expectant women need to pay attention to their bodies, how they get into bed and how they get up, as well as how they carry themselves throughout the day. It’s extremely important to be careful with any type of weight in order to avoid excessive strain on the back or injury. Fortunately, issues with back pain usually go away once the baby has been born. However, there is always the chance that there will continue to be issues with the back after delivery. It takes time for the body to adjust and to repair itself. To manage back pain, during and after pregnancy, there are several techniques that women can try to relieve their condition. Walking and swimming are both found to be helpful in relieving strain on the back. Using a footstool, resting, and taking advantage of cushions for support are also useful. Women with Pelvic Girdle Pain can adjust the way they sit, use a pillow to support their legs when they are in bed, and avoid activities that aggravate their pain. Coping with back pain is possible with a variety of approaches and exercises.One of the best things a woman can do at any time in her life is to develop a strong core. A pregnant woman should listen to her body, rest whenever possible, and do whatever she can to support her back at all times.